Adobe surprised everyone by showing off a new hardware effort today at its annual MAX conference, including Project Mighty and Napoleon. Mighty is a pressure-sensitive digital pen that works with tablets and stores a wide variety of settings and preferences in the cloud. Adobe showed it off working on an iPad, and it looked similar to what we’ve seen from existing pressure-sensitive input devices from other companies, but with tighter integration into Adobe products. It can pull in stored Kuler color palette themes from Creative Cloud, for instance, as well as brush settings and a cloud clipboard that stores assets you’ve created previously for use in new drawings. Moving from tablet to tablet preserves the settings associated with your pen, which makes it possible to take everything from tablet to tablet. Napoleon looks a little like a modern Apple remote, but allows you to easily draw straight lines and arcs via snap tools combined with digital pens like Mighty. It’s almost like having traditional drafting tools including squares and triangles, but better suited to digital media. For precise drafting and more serious, demanding graphics work, these two tools in tandem should help push creativity on mobile devices quite a bit further than what we have available today. 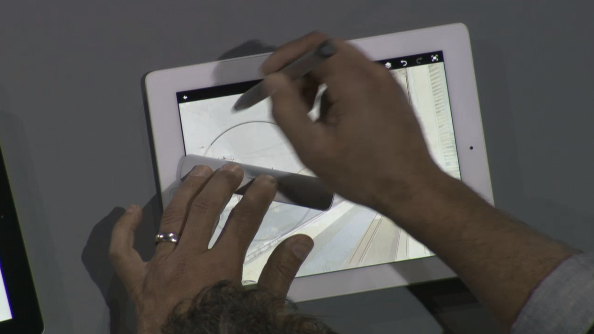 The Mighty pen itself looks similar to something like the Jot Touch 4 pressure sensitive pen, but with full access to Adobe’s Creative Cloud services behind it. 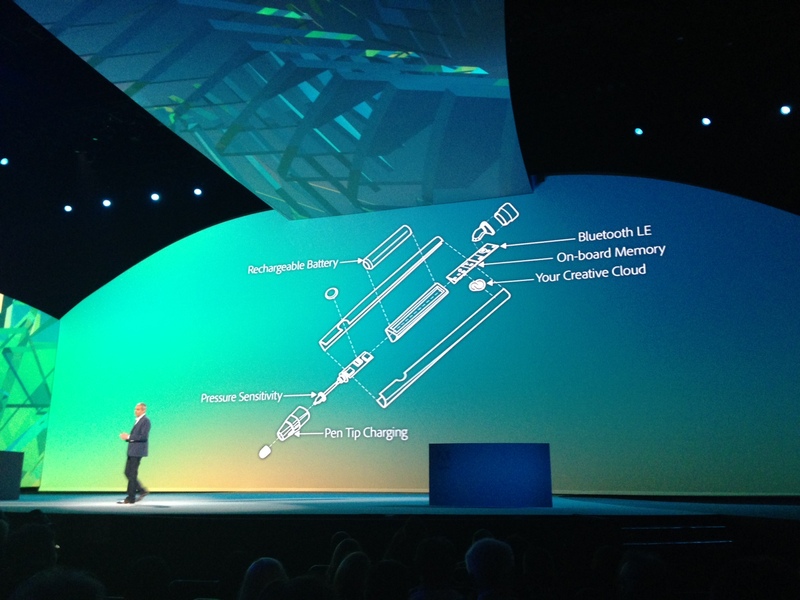 It’s a little like an entire artist’s box in a single device, judging by what Adobe has shown us on stage today. It also takes advantage of non-stylus touch, too, in a way that looks novel, allowing users to do things like erase with their free hand. But when paired with Napoleon, it becomes much more powerful than what we’ve already seen, which should really push the envelope on mobile creativity. The pen boasts an LED on the back that can display different colors depending on what a user is doing with it, and there’s a button for connecting via Bluetooth. The ruler has two touchpoints on its underside to give the tablet its orientation, and the pen has managed to make Apple’s iPad recognize even small touches, which it actively tries to ignore using its built-in accidental touch software. Adobe isn’t saying exactly how it pulled that one off, however. This is still essentially a project in the R&D phase, Adobe noted, but we will definitely see it materialize down the road as a real product, they said. The real question will be how this can compare to for-purpose devices like the Wacom series of tablets, which are much better than anything else out there in terms of pressure sensitivity, latency and overall ability to mimic the experience of working with traditional artists’ materials.